No, this is not a post about introducing Data Vault, but a post referencing materials that introduce Data Vault. I've collected blog posts, articles and book references for you to browse to get to grips with Data Vault. If after all this info you still have questions left (or maybe even more than you started with), come back here and I'll see what I can do. The following blogs have entries for introductions to Data Vault. +Hans Patrik Hultgren has written a blogpost here. Martin Ouellet did a good blogpost about Data vault on his blog. +Daniel Linstedt has a good post on it here, and an additional one here. He has also a slideshare presentation here. Several blogs about Data vault from the people at lucrum can be found here. There are also some blog entries on AgileDSS describing basic Data Vault (modeling) and architecture. Supercharge your Data warehouse by +Daniel Linstedt, Modeling the Agile Data Warehouse with Data Vault by +Hans Patrik Hultgren. Introduction Papers for Data Vault. The TDAN Articles are quite old but still readable. +Kent Graziano has a paper, slideshare intro as well. +Hans Patrik Hultgren has a DV into paper as well. Nippur has also an introduction presentation online here. My own SQLBits presentation is also still online here! Wikipedia also has a Data Vault article. +Roelant Vos has written an article about Data Vault. A presentation of his can be found here. See my Data Vault Agenda for more information. Except courses from the MATTER program most events and courses (also) target the novice audience. +Stefan Frost blogged on his toolbox blog about Data Vault vs. , +Kent Graziano did a comparison here . Hennie de Nooijer did a comparison in his blog here. Wherescape has also a comparison on data vault here (slidshare from Wherescape is here) The bibackend has a comparison here. Another comparison for Data Vault has been blogged about by +Roelant Vos here. A dutch blog by worldofintelligence is here. There are several example models on Data Vault around the net. this post tries to list the ones publicly available as blog posts or as downloads. The SQL Server Northwind database has been used as an DV transformation example in the original TDAN Data Vault papers by Dan Linstedt. You can find the paper with Northwind here. Another blog where Northwind is used is the wherescape blog here. The pdf files of both the original and the Data Vault are also available. The Nothrwind database was an example database from Microsoft for it's SQL Server DBMS product. 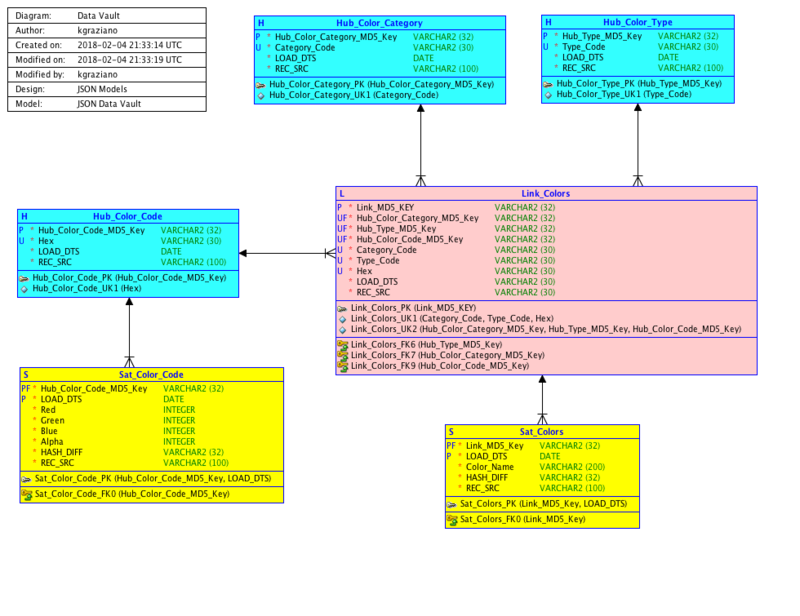 The original database is, like a lot of example databases from DBMS vendors, quite badly designed. For Data Vault this gives some nice issues to solve going to a Data Vault. The given example however is very basic. It ignores the use of reference tables and for examples sake solely creates a link for the orders table where a hub & link would be more apropriate. It als does not assign Data Vault sequence numbers. On Sourceforge there is also a National Drug Code database example created by Dan Linstedt as well as a weblog data vault and a metrics vault. I myself use the TPC-H model's as examples for Data vault transformations. The source model and information can be found here. The different Data Vault model styles will be introduced in detail on my blog in future blog posts. (I still need to fix them up). They are also used in the MATTER program. Other Examples of Data Vaults on the web are for example for mobile solutions. Other people blogged about DV models, like Stefan Frost. Simple examples used to explain Data Vault transformations can be found here and here.